Today marks a 5125 year period of the Mayan calendar, a time of a new era in the pages of human history. The planet has changed, both in society and the environment, blazing the trail for a great spiritual awakening. Technological advancements in the past 200 years have opened the flood gates for information exchange on an unprecedented scale. We are slowly nudging closer to a global consciousness and becoming an integral part of the universal mind. In the future we may look back at this day, at the inspiration and perseverance of our ancient ancestors and give thanks for their efforts to revolutionize existence. We have learned so much about ourselves by looking at the past and there is much more to learn as time presses forward. In the positive future, we will become humble and patient, knowing our current efforts have changed future generations just as our ancestors did for us. Discovery of an interesting phenomena in an ancient world map. 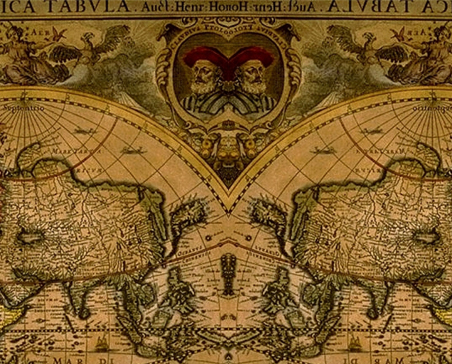 When the world map is mirrored and lined up like a Masonic mirror, a strange figure appears below the frame where the outside globe edges intersect, a figure that appears similar to Dogu in nature. Could it be a hidden reference as sometimes ancient charts held, or is it just a coincidence? This was discovered while creating a banner image for the sub-Reddit. 2012 Doomsday, Apocalypse, or a New Age? Is it really a doomsday apocalypse, or just a pure movement into a new age of peace? As the Hopi speak of Blue Kachina, and the world awaits the fate of the Mayan Calendar, you can join everyone in an Earth-wide celebration of a new era. Many believe the calendar marks the end of times, but many also believe it marks the coming of a new age in a historic time of change. Join the event to commemorate an ending of the Mayan calendar 5,000 year period.